Replacement of existing or failed Honeywell DU-870 CRT display units provides the opportunity to modernize the Learjet 40/45 with multiple configuration options. One-for-one drop-in replacement of the DU-875 is accomplished by STC and require no aircraft modification. Minimal downtime for display replacement. No wiring or aircraft modifications for DU-875 one-for-one replacements. No additional pilot training due to the preservation of Legacy display formats. Provides more clarity in all cockpit lighting conditions compared to CRT displays. 7 pounds of weight savings per display unit replaced. Growth path to Primus Elite. Discount in annual Honeywell Avionics Protection Plan (HAPP) cost. 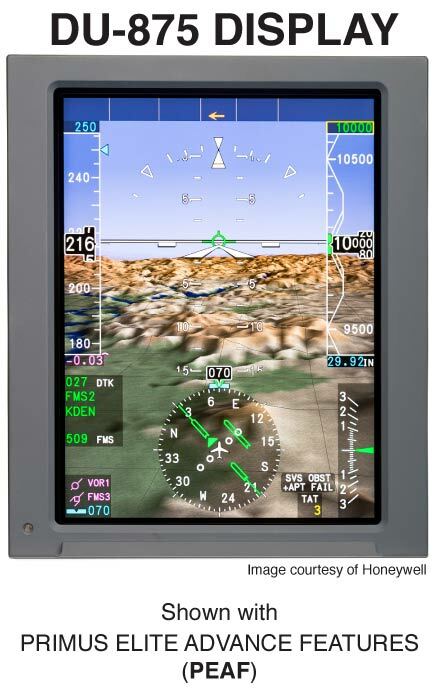 Primus Elite can be achieved by replacement of all four DU-875 displays, display mounting racks, the addition of a DL-1000 Data Loader, and the addition of a Custom Cursor Control Device for the Learjet 40/45. DL-1000 Data LoaderLearjet 40/45 Enhanced Functionality Installation Kit. Primus Elite Advanced Features (PEAF) is a software upgrade to the Primus Elite display system. PEAF provides three additional display features to Primus Elite. No STC is currently available for the Learjet 40/45, a completion date is currently TBD but is underway. Increased crew situational awareness with the integration of Synthetic Vision System (SVS). Primus Elite Advanced Features software package installation to the Primus Elite system.